19 Beautiful Waltzes with Walter Ostanek! 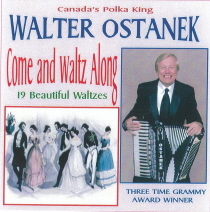 Canada’s Polka King Walter Ostanek plays 19 beautiful waltzes on this CD. “Come and Waltz Along” with Three Time Grammy® Winner Walter Ostanek. Don’t pass this fine CD!